The brand-new campus of the Vienna University of Economics and Business will host all rounds of Vienna EUDC 2015. You can already check it out. Vienna EUDC 2015 will take place in a close cooperation with WU Wien, Vienna’s University for business and economics related subjects. DKWien has been cooperating with the University since 2004. Since then, one of the weekly training sessions takes place at WU Wien. This long tradition of cooperation will be even intensified for EUDC 2015, since the University sees EUDC 2015 as a chance to promote it’s excellent infrastructure and it’s outstanding programs among international students. 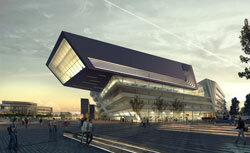 To make things even better, WU Wien moves into a brand-new campus in late 2013. The new venue has loads of space. It provides modern class-rooms and learning facilities for over 20000 students. Moreover, there are several cafés and a supermarket directly on the campus. As if that would not be great enough, the new campus is located right in between Prater and the Danube, next to the Vienna Fair. As a consequence it is next to Vienna’s prime recreational areas and is prefectly connected to airport and city by direct subway and buses. The WU Campus is ideal for Vienna EUDC. All in-rounds will take place there, in modern, air-conditioned class-rooms. The announcement rooms will be located in the centre of the campus, which guarantees short walking times from the draw to the debate. Furthermore, since the campus is located so conveniently, most socials will take place in direct proximity to the campus area – saving you time to relax. Welcome to the 5min EUDC.